Alex attends Manchester University where he is studying for a degree in Business and Marketing. Prior to this he was a pupil at Altrincham Grammar School for Boys. He is one of Martin’s three sons, but the only one whose sporting focus is on karate. 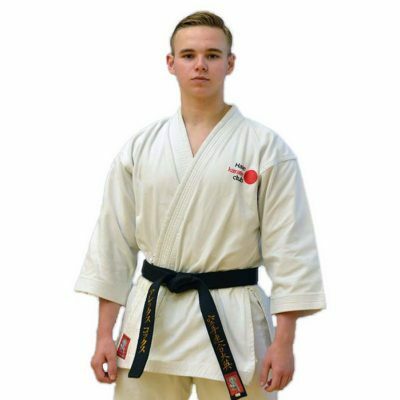 His hard work and ability has earned him success in regional and national competitions, leading to his call up for the England national squad in kata and kumite. Within the club, Alex leads training for students of all ages and abilities, but he is particularly good at working with children. His ability to describe movements in a straightforward way, using examples the children can understand, helps them quickly grasp the subtleties of the techniques and establish good form and habits early in their karate training. They identify well with him. Working 1 to 1 or in small groups, he is able to ensure children do not feel overwhelmed by the pace of training and the level of concentration required. In addition to his teaching, Alex also trains under Senseis Sherry and Harford. He doesn’t view his black belt as the end of a journey, but as the start of a new stage in his development in the sport. Alex represents his country on the KUGB England Squad in both Kata and Kumite.